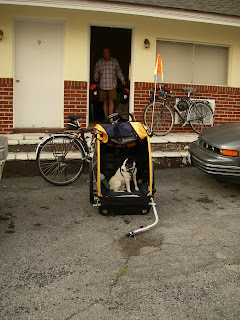 Saturday morning Jack was ready to go before we were. We pulled out onto Hwy 19 into a light fog around 8:30 knowing the sun would burn off the fog by 9:00. Only a few miles down the road we headed east again on Hwy 80 for the final climb over the "young" Appalachians. Eastern Kentucky and western Virginia contain the eastern half of the Appalachians which is geologically younger than the older range in central Virginia which contains the Blue Ridge Parkway. One of our observations in eastern Kentucky and western Virginia is the placement of the county lines at the top of the ridges. In fact this was important to us since it signalled that we had finally made it to the top. Below you can see the approach to the climb over Clinch Mountain and through Hayter's Gap. The climb was tough and the descent was very steep and we had to stop to adjust our brakes. At the bottom of the descent we headed north from Meadowview on Hwy 11. This road was originally known as "the Wilderness Road", then became "the Great Road" and finally Lee Hwy (Hwy 11). It heads northeast through the Shenandoah Valley which separates the two ranges of the Appalachians. Throughout Missouri, Illinois, Kentucky and now in Virginia we have seen the small lavender Chicory flower above in abundance on the roadside. It has been in full flower since July and brightens the roadsides. Today we have rested in Marion after cycling 389 miles in the last 9 days in the mountains. Tomorrow we continue northeast over flat to rolling terrain, hurray! It's good to see that Jack will keep you on track in case you start slacking off near the end of your trip. I can't remember your final destination. Is it in Virginia or farther north? Is that the same chicory that is in some herbal teas? It's a pretty flower. Hi Riesa, Well there's no slacking off yet, we've still got some mountains to cross. 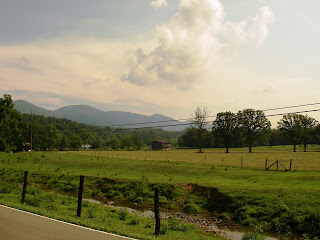 In a couple of days we will be on the Blue Ridge Parkway. Our immediate destination is Yorktown,VA. on the coast. Then we will see how much energy we have. We have been planning to ride to Massachusetts, but we have been re-thinking that lately. 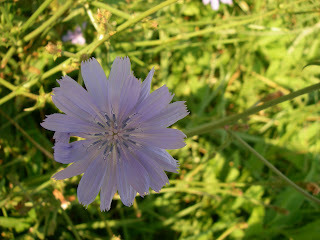 Yes it the same chicory as in herbal teas. I agree it is a pretty flower and is quite striking when massed along the roadsides.